The Batman Universe gets stylized and miniaturized. 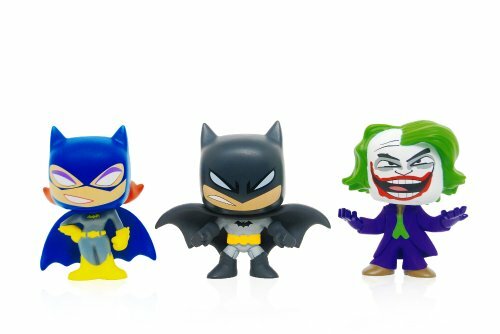 This Batman DC Comics Mystery Minis Vinyl Mini-Figure Display Box features some of your favorite characters from the Batman Universe as 2 1/2-inch tall stylized vinyl mini-figures. 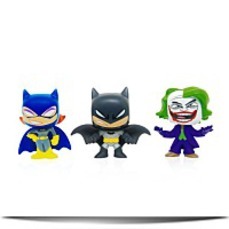 You'll get Batman, Batgirl, Catwoman, The Penguin, The Riddler and The Joker. There are even figures from Christopher Nolan's The Dark Knight film. Dimensions: Height: 2.75" Length: 1.5" Depth: 1.5"
Package: Height: 2.7" Length: 3.7" Width: 3.1"